Zoe Lester, graphic designer at Pulse Brands. Education in Lebanon is not free and for the majority of children living in refugee camps it is completely neglected and unattainable. Described in their hundreds of thousands as ‘Syria’s lost generation’ they are lacking the essential development and self-esteem that education can provide. Kitabna writes and illustrates story books that connect culturally with the children and local surroundings. 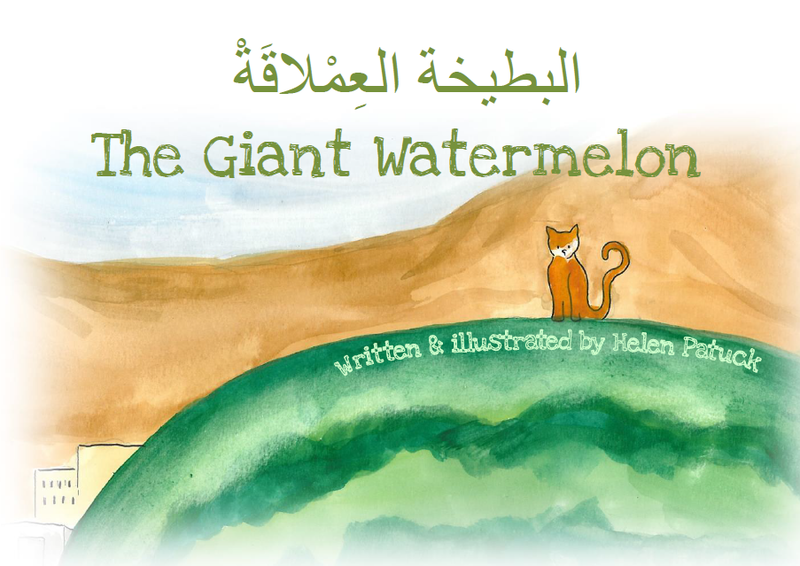 Their first book, لبطيخة العِمْلاقَةْ The Giant Watermelon, was written following visits to camps in the Beqaa Valley, eastern Lebanon, where they were shown a vegetable patch growing two watermelons. The story of Kitabna started back in 2008, when Helen Patuck was teaching English in Bangladesh. The books children were given to learn English from were often second-hand offerings from Western aid agencies and did not reflect the cultural or environmental realities of the children reading them. Taking a few basic ideas, Helen rewrote and illustrated a traditional folk tale about working together towards a common goal: a meal to be shared. She used the names of the children in the school and set the story in their villages. This way, the English tale of The Giant Turnip became the Bangladeshi tale of The Giant Carrot. we aim to set warm and fun stories in refugee camps, creating pride and dignity in an environment which is home for these children and will be until the sectarian violence ends. we aim to encourage reading and writing skills in both English and Arabic through the creation of bilingual children’s books. we aim to stimulate imagination and encourage children to help each other create and learn. 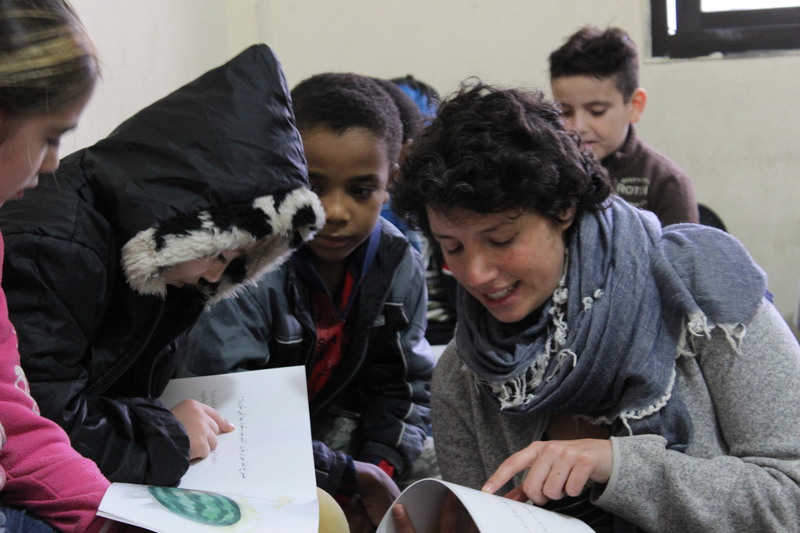 we aim to develop the children’s storytelling abilities by encouraging them to write their own stories. Kitabna have now written five books – the most recent is The Starlings Visit, based around the migrating birds that fly to the deserts of Northern Iraq. This book will be given to displaced children living in Northen Iraq and aims to not only help children with their reading and language skills, but also bridge the cultural gaps faced within this area by including three languages, Sorani Kurdish, formal Arabic and English. 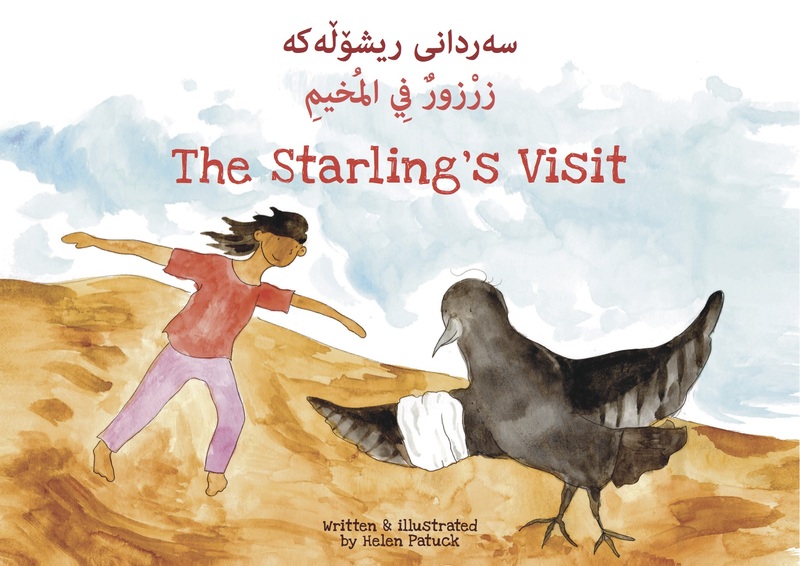 The fifth book from the Kitabna project, The Starling’s Visit has been created specifically for the persecuted Yazidi refugees in northern Iraq and is based around the migrating starlings that fly to the deserts of Northern Iraq. Through an initial introduction by Pulse, the Kitabna project has successfully received funding from AMAR – an NGO operating in Iraq and will be distributing these books to children who come from Yazedi, Sunni, Shia Muslim, and Christian communities. The book, available in English, Arabic and Kurdish, intends to promote social cohesion and provide psychosocial support. If you work with displaced people and would like to order or commission books, please contact Helen on helen.patuck@gmail.com. Zoe Lester is a graphic designer with a strong focus on design to incorporate a social purpose as well as reflect an optimistic future. Over the past four years she has developed a broad approach to design outcomes through illustration, typography, 3D design and spacial design. After studying graphic design at University College Falmouth she has gained four years’ experience supporting clients such as CCP, Artraker, Moneyline, The Hub, Studio Tilt, Active360 and most recently The Kitabna Project.